We are a full-service Real Estate company, fully licensed and bonded in the Province of British Columbia employing a team of knowledgeable Real Estate Professionals who are eager to assist you with your real estate needs. Our independent sales force enjoys diverse expertise and success in the real estate market, with specialties in development properties, sales of new construction, leasing, commercial, residential, property management and insurance. Multiple Realty Ltd. is a member of the Canadian Real Estate Association, BC Real Estate Association, Real Estate Board of Greater Vancouver and is an Associate member of the Fraser Valley Real Estate Board. 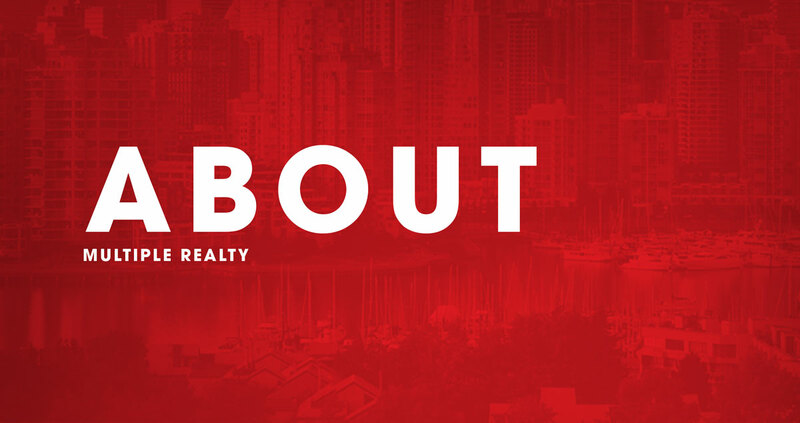 Multiple Realty has a rich Vancouver history that we are proud of. Our long-standing success in training and supporting our agents to offer the best real estate services for their clients ensures that you’ll always be taken care of. Multiple Realty was founded in Vancouver by John Ma and a small group of partners who aimed to create a brokerage that would find success through the success of its people. This belief became our fundamental philosophy and continues to be the driving force of our success today. Now, 36 years later, Multiple Realty offers a knowledgeable team that is backed by their long local history. Multiple Realty aims to provide the best possible experience for their agents, buyers, and sellers. To consult with any of our licensed real estate professionals about your real estate needs please contact us at our Vancouver or our Richmond office.